Anyone else hear about this new fad called “spring cleaning?” It’s where you clean stuff simply because the season has changed? It’s all the rage in my house right now. We are pulling apart closets and cleaning in corners we didn’t even know we had. It all started because I was tired of my ugly wardrobe. I don’t know about you but I am kind of over selecting outfits based on their ability to camouflage snot stains and glitter. Before kids if something didn’t fit I would just go buy something new. I didn’t worry about labels like, “machine washable,” or “dry clean only.” I had plenty of stylish clothing to wear to work, out with friends and while lounging at home. Now, I can barely tell those outfits apart. So, I decided to spring clean my wardrobe. I started by thinning out the clothes I could no longer wear based on size, location of stains and tatters. This left me with a sparse amount to work with, but I’m a creative mom! I can make toddlers believe terrible things will happen if they don’t eat their peas! Next, I coordinated a few outfits to have at the ready for moments beyond the standard issue mom uniform (t-shirt, jeans and sneakers). I waste so much time over thinking and rethinking an outfit before leaving the house. Having outfits I can just grab and go saves me from all that! I layered accessories right on the hanger so I have a complete outfit. When I finished, I realized my makeup bag could use a little rehab. I have some “vintage” pieces in there it was time to let go of. I don’t have a lot of time for make-up, but there are days I want a casual look. My new dash out the door (can’t tell I didn’t sleep a wink) look consists of a tinted moisturizer with an SPF, cream eye shadow I smear on with my finger, mascara and lip balm. Kiss My Face Lip TreatMint is the only lip balm I wear ever ! Feels great and the SPF covers me for play dates at the park! After I cleaned everything up I realized my nails looked shabby too. 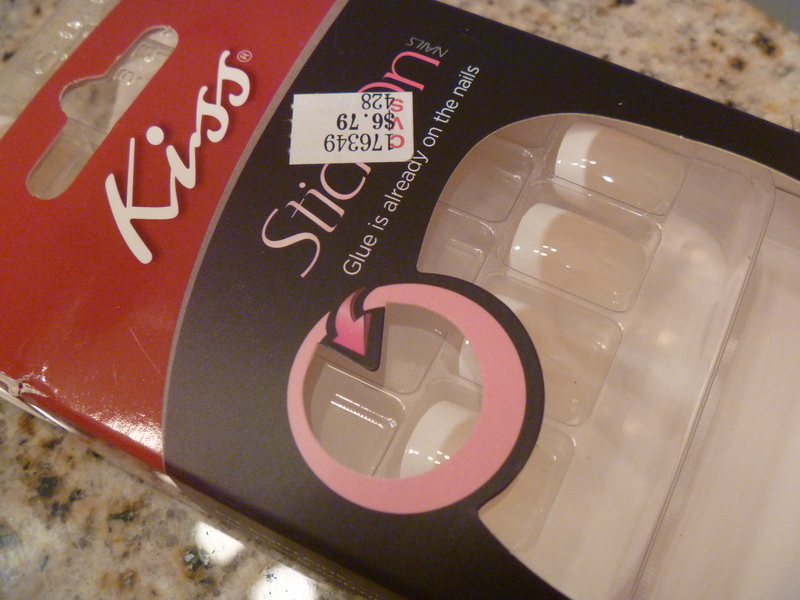 It seems the mani/pedi is the first thing to get the boot when moms go on a budget. A friend of mine shared her secret for a one minute manicure- press on nails. I know sounds really tacky (no pun intended). But, not only did my husband think I spent big bucks on a manicure, I also got a lot of compliments from friends and strangers. These are great for date night, mom’s night, grocery shopping, or whatever. I don’t have to find time to get out to the salon. No dry time! No smudging! Instant manicure- no baby sitter required! Three and a half years into the mom gig and I realize how easy it is to get sucked into a wardrobe rut. It’s sad how little I’ve invested in my appearance due to time and feeling overwhelmed. 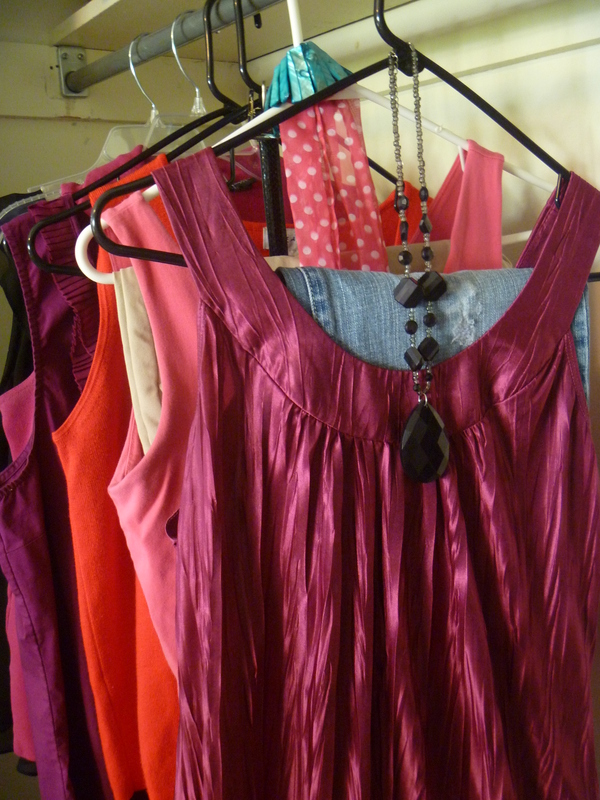 Now I have a simple, clean wardrobe to select from and I gain a few extra minutes in my day with a simplified routine. What does your mom routine look like? What are some tips for keeping your wardrobe current? 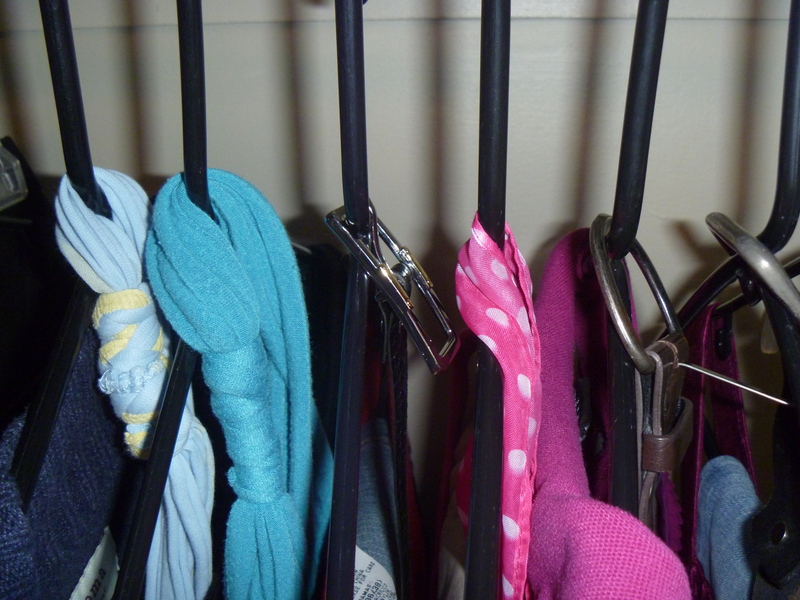 I never would have thought of attaching accessories on the hangers with an outfit. Wish I would have done that years ago, it would have saved me a lot of time. Thanks Roxanne for the tip and the visual confirmation of what the outfits look like on the hanger all together. That was great. I am not sure how I am going to set up a mom routine yet! I still have a few months before our baby girl is born but I have got into the getting up early and forcing my self through the day a few times a week to prep for the baby marathon of no sleep once she gets here. I already set my outfits up in the closet and I trade out clothing based on seasons. I have however changed up some of my organization setup to bring them down to kid levels and put others higher. What suggestions do you have on getting ready for baby? Sounds like you are already pretty organized. In regards to prepping for sleepless nights… don’t prep. Nothing will prepare you. Get as much rest as you can now b/c it will be a very, very long time before you get enough! My suggestions getting ready for baby is be flexible and its ok to do whatever you need to do to get through an exhausting day! 😉 I think you’ll do great mama! I am an advocate of thinning out the wardrobe twice a year and donating to my local church or goodwill. I have more room for my favorite outfits and feel like I’ve given back to my community. It feels great! Clothing stores also clear out the racks at least twice a year so I will comb the clearance racks for super cheap tshirts that are great for both day and bed time wear! After buying hockey gear for my son, I have no money left for clothes. But you can find some new fav items for pennies, well a few dollars anyway if you shop the clearance racks!